With the advancing technology, the use of technology in our daily lives has also increased. Whether it be reading news, doing your homework, or even interacting with your peers, Smartphones and the internet play an important role in such things. With the increased usage of Smartphones, many educational institutes have also started utilizing apple iPhones and iPads in the classrooms. Teachers are very excited about the usage of tablets as well as Smartphones as it allows them to discover and explore different ways through which they can help the children understand and learn about the different concepts being taught. Not only the teachers but the children are excited to benefit from it too. They want to use it in order to learn thing rather than just fooling around with the gadgets. Few years back, bringing Smartphones and tablets to the classrooms would end up in punishment however nowadays, bringing these gadgets to the classroom has become imperative and essential as well. The advantages of using Smartphones and tablets in the classrooms, outdo the disadvantages. 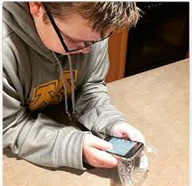 The use of Smartphones and tablets in the classroom allows the students to research the internet regarding a certain concept which might be confusing them. This also greatly helps them when it comes tor referencing. Not only does it help the students but also prove to be very helpful for the teachers. They too can benefit from the numerous advantages of the internet. The students can take a picture of the homework assignment or even lecture notes that the teacher has given or written on the whiteboard. What more students can also use these gadgets to make a video of the lecture that might help them in the preparation of their exams. With the inventions of numerous applications, it now has become possible for the students to learn through them, and even take tests using them. This can help them prepare their exams for the school. But like everything this new technology has its disadvantages as well. Children might get distracted or even misuse the gadget in the classroom, not paying full attention to the lecture being given by the teacher. It can also irritate the teacher as many students who are not actually interested in the lecture might try to distract those, who DO pay attention to the lecture of the teacher. But Apple iPhones being used in the classroom increases the risk of damage as well. Children are very careless creatures. They might either drop the device or damage it. In such cases need for a professional repair service is necessary. ScreenFixed provides iPhone 5 screen replacement services in Brisbane, Toowoomba, and Logan City. So don’t worry and just call, or bring your broken Apple iPhone to us and we will ensure that you get a perfect fix. Screen Fixed founded by Ben Turner prides itself on giving customers an amazing user experience, using the original parts and 2 years warranty on all repairs.